Leticia, the capital of the Colombian department (province) Amazonas, is a beautiful and peaceful town at the Amazon with a friendly population. Leticia is just inside Colombia near the border with Peru and Brazil and has appr. 23000 inhabitants. It's a well developed town with a modern hospital, a telecom company, a Banco de Bogota that has ATM on Cirrus network and where you can exchange travellers' cheques. It even has an internet café. Furthermore you will find there a small zoo and the well known "Parque Santander". Every evening you can see in this park hundreds of parakeets return to their "sleeping tree". It's really a spectacular site to see and to hear! Leticia has some nice restaurants where you can have a decent meal for a few peso's and cozy bars with terrace. Soon you will get in touch with "the local's" who will give you a warm "home" feeling. Of course there are some nice gift shops but its more fun and cheaper to buy your souvenirs by the original Amazon Indians during a tour. If you like to go out for a "swinging night" you can go the local discothèque in Leticia or in the one in Tabatinga, a Brazilian village 4 km away (just over the border). Every Friday night there is live dance and music in the Brazilian discothèque . Surely worth while to take a look!!!!!!! The hotels are clean and in different classes. You can choose for a room with or without air-condition. Recommended are i.e. "Residencias Fernando" and "the Amazon Hotel". If you are looking for more comfort and luxury there is also "Hotel Anaconda". At the portside there's always a lot of activity. 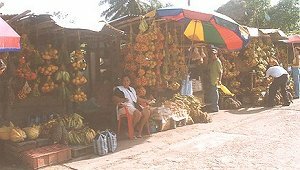 Leticia is namely a small business center where people from the near villages come to buy and sell fish, fruit and vegetables. 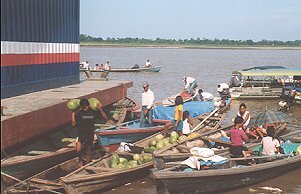 The merchants and customers navigate in long, small canoes with simple but "typical Amazon" outside motors. It is a nice place to sit in the morning and watch the "normal" live go by while you are enjoying a cup of Colombian coffee! Very typical for Leticia and his Brazilian neighbour city Tabatinga is the local transport. Most people are driving on mopeds. You can see them in all different sizes. Sometimes you will see a whole family on just one moped!! If you want to explore the neighbourhood, the best way is to hire one of these mopeds. By the way, the outside temperature in Leticia?? Most of the time its tropical (above 30 degrees Celsius)!!! It's very easy to travel from Leticia to Manaus in Brazil or to Iquitos in Peru. 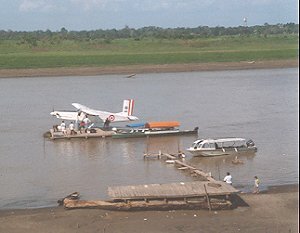 Traveling to Iquitos can be done with a fast boat (about 8 hours) or with a "normal" boat (about 3 days). If you want to go even faster, then there is also the possibility to go with a Catalina! The boat to Manaus takes you there in 4 days. 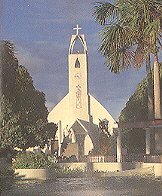 Of course you can also go to Manaus on the adventures way.......with us!! Before leaving Leticia don't forget to get the entry and exit stamps for leaving Colombia and for entering Peru or Brazil! !